​The Gamera/Daiei Movie Database section includes all Daiei kaiju films. Each is listed by the Japanese title, followed by the American title if different, with years of release. To the right of the title is the rating of each film via IMDB. Each listing here on this page is a small piece of the full article, the link at the bottom of each post goes to the full article that is also here within the site (safe, no external links). Information in this section comes from Wikipedia, IMDB, and other sources. Gamera the Giant Monster (大怪獣ガメラ Daikaijū Gamera, lit. Giant Monster Gamera) is a 1965 Japanese kaiju film directed by Noriaki Yuasa and starring Eiji Funakoshi, Harumi Kiritachi, and Junichiro Yamashita. It is the first entry in the Gamera film series, and was the only film in the original series released theatrically in the United States. In an icy North American region, an unknown aircraft is shot down by an American fighter jet. The aircraft crashes and its cargo, a low-level atomic bomb, explodes. The resulting cataclysm awakens a giant, prehistoric monster called Gamera, who has the appearance of a giant turtle with teeth and large tusks. Japanese scientists on an expedition (including Dr. Hidaka, Kyoko, and Aoyagi) nearby are given a "devil stone" by an Eskimo chieftain, who explains that the creature is called Gamera. Gamera destroys the American jet with his fire breath and escapes into the sea. The monster heads to Japan and surfaces from Sagami Bay, where Toshio, a boy releasing his own pet turtle, sees him. Gamera destroys the city of Fujisawa and a lighthouse. However, he also rescues Toshio from falling from that same lighthouse and then retreats back into the sea. Scientists and government officials hold a conference to discuss killing the monster. 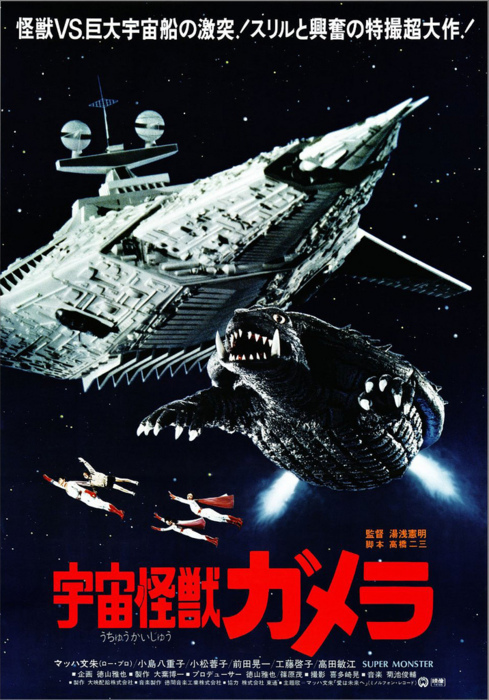 ​Gamera destroys a research ship, kills the crew and then heads to Tokyo. He is attacked with freeze bombs and blown up, falling onto his back as a result. The scientists indicate that a turtle cannot right itself once on its back and that Gamera will therefore die of starvation. 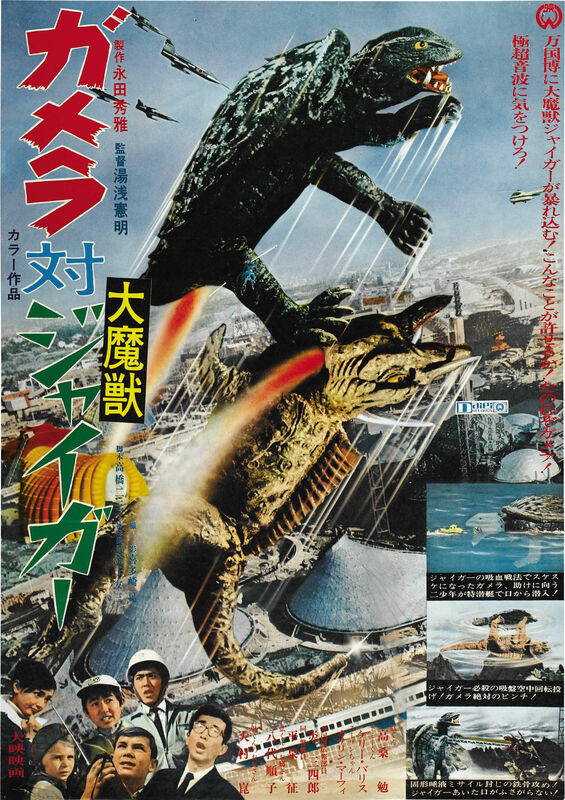 ​Gamera vs. Barugon (大怪獣決闘 ガメラ対バルゴン Daikaijū kettō: Gamera tai Barugon) is a 1966 Japanese kaiju film directed by Shigeo Tanaka. It is the second entry in the Gamera film series and was released directly to television in the United States by American International Television. Set six months after the events of Gamera: The Giant Monster, a meteorite collides with the Z Plan rocket transporting the creature to Mars. 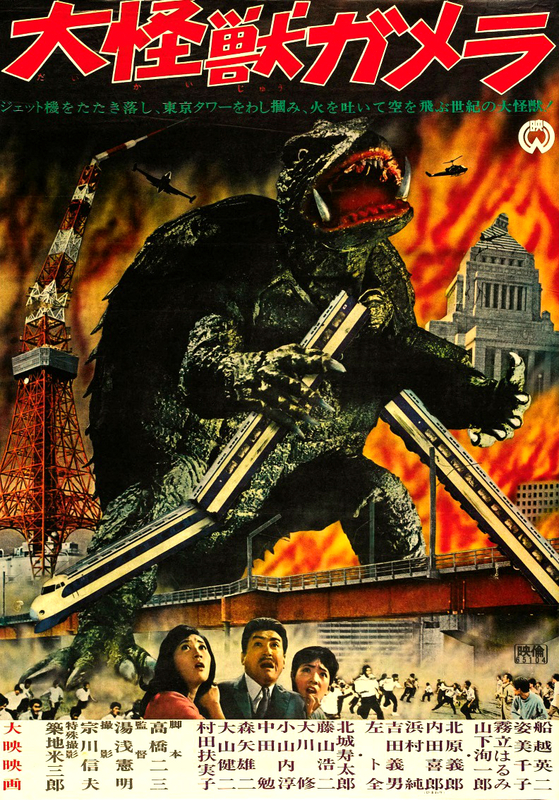 Now free, Gamera returns to Earth and destroys Kurobe Dam in Japan. At the same time three mercenaries are sent by Kano, a World War II veteran, to an island in the South Pacific to retrieve a huge opal he once found and hid in a cave. Despite warnings from the local villagers, the trio find and locate the opal, but one dies from a fatal scorpion sting. The second man, Keisuke, Kano's younger brother, is betrayed by his fellow expeditioner Onodera and apparently killed in a cave-in. En route back to Japan, Onodera accidentally leaves the opal exposed to an infrared light. The heat incubates the opal - actually an egg - and a lizard eventually hatches. Growing to enormous size very quickly, the lizard destroys the ship and Kobe Harbor. Keisuke, having survived the cave-in, awakens in the care of the villagers. He then returns to Japan with a village girl called Karen, who refers to the lizard as Barugon. Barugon wreaks havoc in Osaka with its freeze-gas emitting tongue and stops the launching of the retaliative missiles with a rainbow-like ray emitted from seven spines on the middle of its back. ​Barugon encounters Gamera and the two battle, with Gamera eventually being frozen solid. 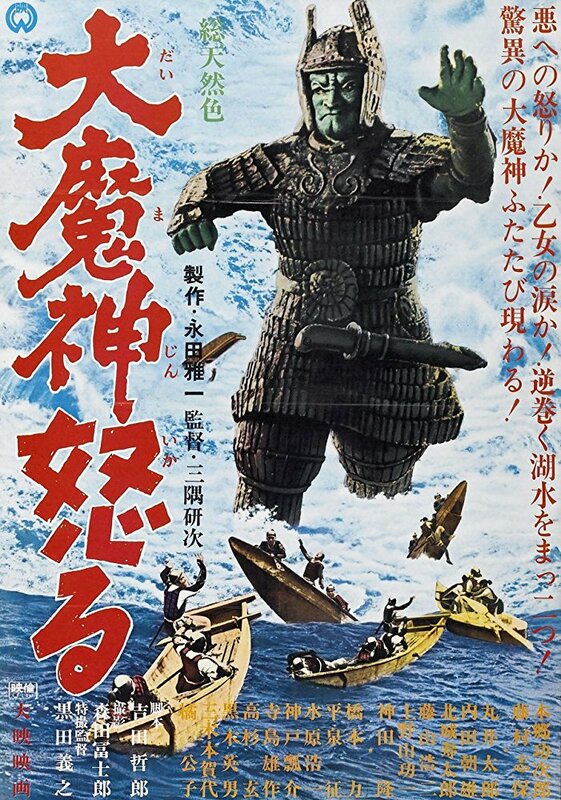 Daimajin (大魔神) is a 1966 Japanese film of the Daimajin series directed by Kimiyoshi Yasuda. Its musical score is composed by Akira Ifukube. The film had a brief stateside theatrical release in 1968. Reportedly, it was shown both in Japanese with English subtitles and dubbed into English. The English dubbed version was later released directly to TV by American International Television under the title Majin the Monster of Terror. As the villagers pray, Samanosuke and his henchmen slaughter Hanabasa and his wife, but their son and daughter escape, aided by the heroic samurai Kogenta (Jun Fujimaki). Back at the shrine, Samanosuke's men break up the meeting, forbidding all such gatherings in the future. The priestess issues a dire warning, but the men ignore her. Discouraged, the priestess, Shinobu, goes home, only to find Kogenta and the two children. She takes them up the side of the mountain, into forbidden territory, where the stone idol which is Daimajin stands, half-buried into the side of the mountain. Near this idol is an ancient temple - safe as only Shinobu knows of its existence. 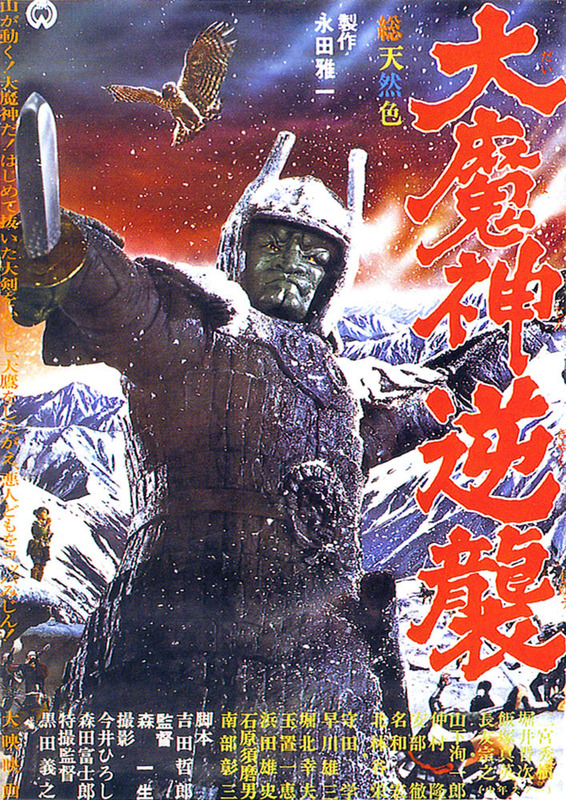 Return of Daimajin (大魔神 怒る Daimashin Ikaru, lit. 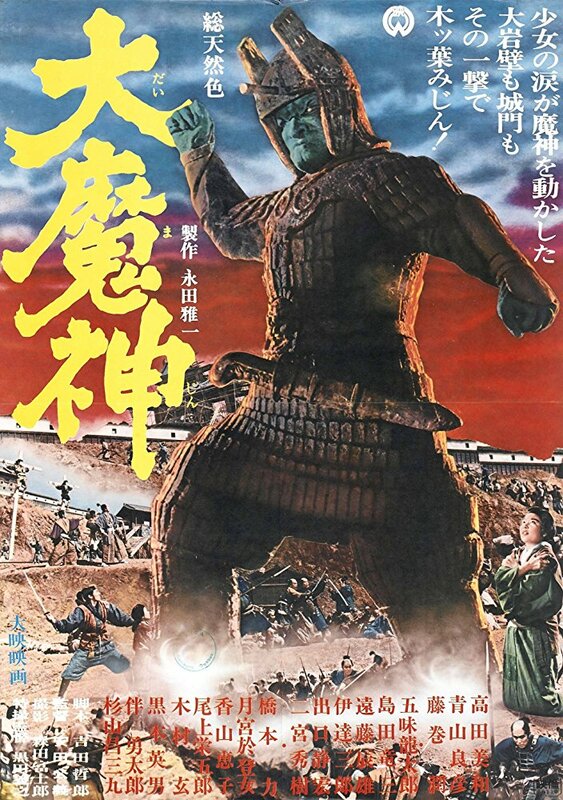 Angry Daimajin) is a 1966 tokusatsu kaiju film produced by Daiei Film Co. Ltd. It is the second film in the Daimajin trilogy. In The Return of Daimajin, the second film in the trilogy, Daimajin has taken up residence on an island in the middle of a lake. The lake is surrounded by two peaceful villages, Chigusa and Nagoshi. Near these two villages, but not bordering the lake, is another village. Ruled by an evil lord, the citizens flee to Chigusa as often as they can and make their way there, where the lords are only too happy to take in the refugees. One day the evil lord decides to take over the two villages, and he sees a window of opportunity in a festival that is held every year. The heroes end up on the run as the villains chase them. People keep ending up back on the island with the statue. Eventually, the evil lord has his men shatter the statue with a large amount of gunpowder. Daimajin's shattered remains end up at the bottom of the lake. True to the samurai formula is the amount of melodrama in Return of Daimajin. Occasionally something paranormal happens, but such occurrences are met rather indifferently. In the final fifteen minutes of the film, Daimajin finally comes to life and, like his predecessor, inflicts serious damage upon the evil lord and the surrounding landscape. The crew returns to find the work camp destroyed and a strange green glow coming from the mountain nearby. The work crew goes to investigate. Eiichi finds Okabe in the woods near Mt. Futago recording the same light the workmen saw. Okabe convinces Eiichi that it might be Gamera and the two make their way to a cave. 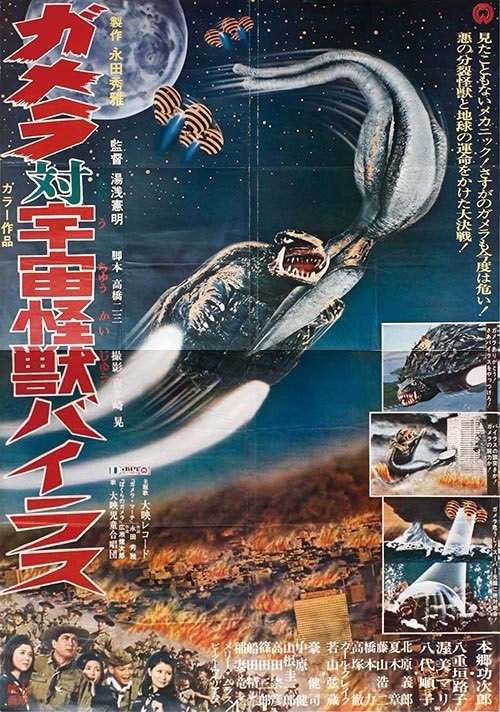 ​​Gamera vs. Viras (ガメラ対宇宙怪獣バイラス Gamera tai Uchū Kaijū Bairasu) is a 1968 Japanese kaiju film directed by Noriaki Yuasa. It is the fourth entry in the Gamera film series. ​While aboard the spaceship, the boys continually try to escape. Gamera, however (under the influence of the aliens), is destroying dams and cities by the handful. Jim and Masao discover a squid-like creature, thinking he is another captive of the aliens. In fact he is the leader of the aliens. Gamera vs. Guiron (ガメラ対大悪獣ギロン Gamera tai Daiakujū Giron, lit. Gamera vs. 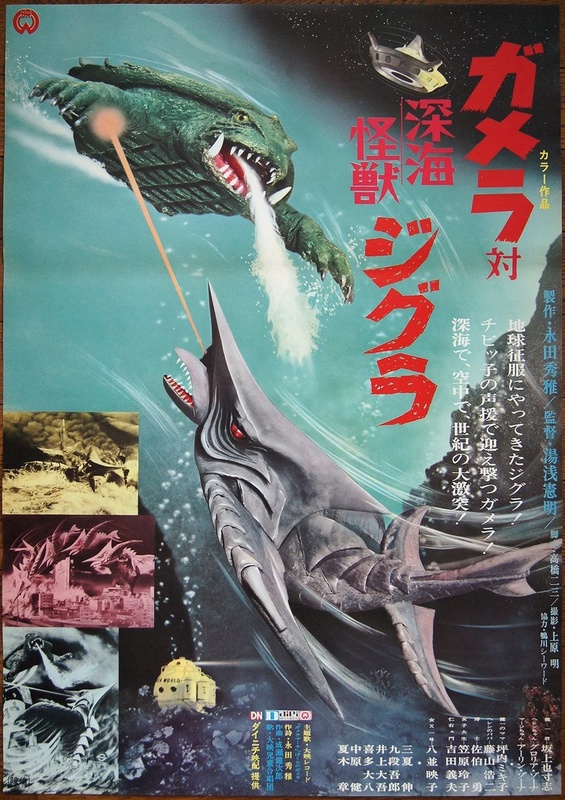 Giant Evil Beast Guiron) is a 1969 kaiju film directed by Noriaki Yuasa. It is the fifth entry in the Gamera film series. After the statue is removed, Jiger makes her first appearance and gets Gamera's immediate attention. The first of several fights ensues and Jiger wins by shooting projectile quills from her face. The quills impale Gamera's arms and legs, piercing all the way through and preventing Gamera from withdrawing his limbs into his shell and taking flight. 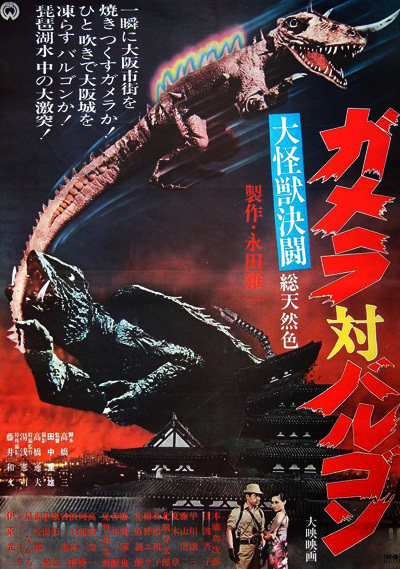 Gamera vs. Zigra (ガメラ対深海怪獣ジグラ Gamera tai Shinkai Kaijū Jigura) is a 1971 Japanese kaiju film directed by Noriaki Yuasa. 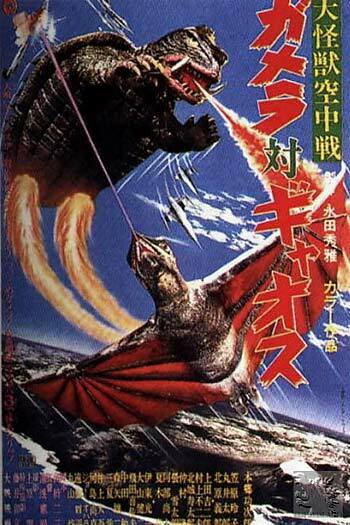 It is the seventh film in the Gamera film series. Without warning, an alien spaceship attacks a Japanese moon base. Back on Earth, young Kenichi (Kenny in the English dubbed version) Ishikawa; his father, Dr. Yosuke (Henry in the English dubbed version) Ishikawa; his friend Helen; and her father, Dr. Tom Wallace, witness the spaceship descending into the ocean. They go to investigate but are soon captured by a teleportation beam that brings them aboard the spaceship. Inside the spaceship, a human-looking woman appears to them and reveals that she is of an alien race called Zigrans. By way of demonstrating Zigran technological prowess, she creates a gigantic earthquake that wreaks havoc in Japan. She had previously caused two other earthquakes, one in Peru and the other in Arabia (in the English dubbed version, it mentioned instead the Indian Ocean). She then tells her prisoners of the planet Zigra's history and its great scientific advances which, unfortunately, have resulted in its destruction; but in searching for a new home, Zigra has found Earth. The woman contacts authorities on Earth and orders them to surrender or she will kill her prisoners. Tom declares that the Zigran woman is insane and, in anger, she sends the two men into a hypnotic trance. Kenichi and Helen take action, successfully using the ship's control console to escape with their fathers. Enraged, Zigra orders the woman to go to Earth and kill the children. She says it would be simpler to kill all the people of Japan, but Zigra tells her that humans must be preserved so they can be used for food. 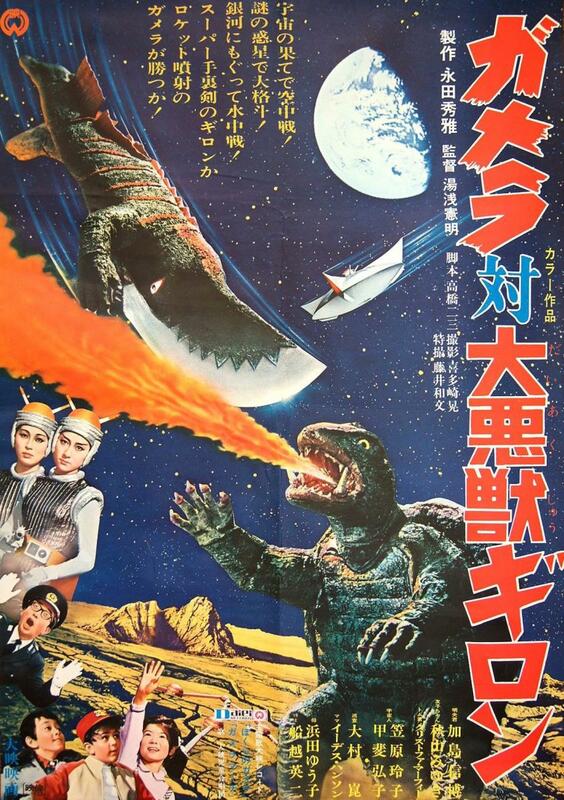 Gamera the Guardian of the Universe (ガメラ 大怪獣空中決戦 Gamera: Daikaijū Kūchū Kessen, lit. Gamera: Giant Monster Midair Battle), is a 1995 Japanese science fiction kaiju film directed by Shusuke Kaneko and written by Kazunori Itō. It is a reboot of the Gamera film series, the first film in the Heisei Gamera trilogy, and the ninth film in the series. It was a co-production of Hakuhodo, Daiei Film and Nippon Television, and was the first Gamera film not to be released by Daiei Film. 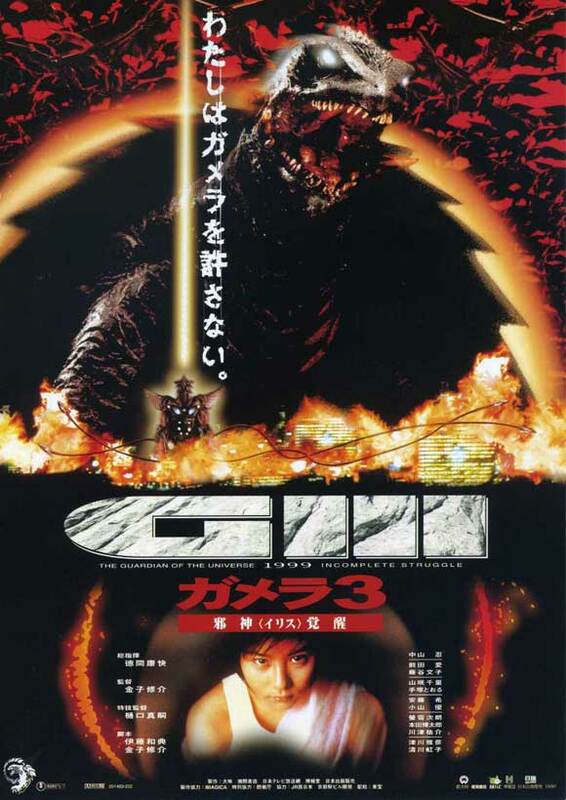 The film was followed by Gamera 2: Attack of Legion (1996) and Gamera 3: The Revenge of Iris (1999). A pair of Gyaos glide across Tokyo's Shibuya district, but are destroyed by Gamera at the cost of twenty thousand human lives, causing the Japanese government to order Gamera's immediate destruction. Gamera the Brave ( 小さき勇者たち～ガメラ～ | Chiisaki Yūsha-tachi ~Gamera~, lit. 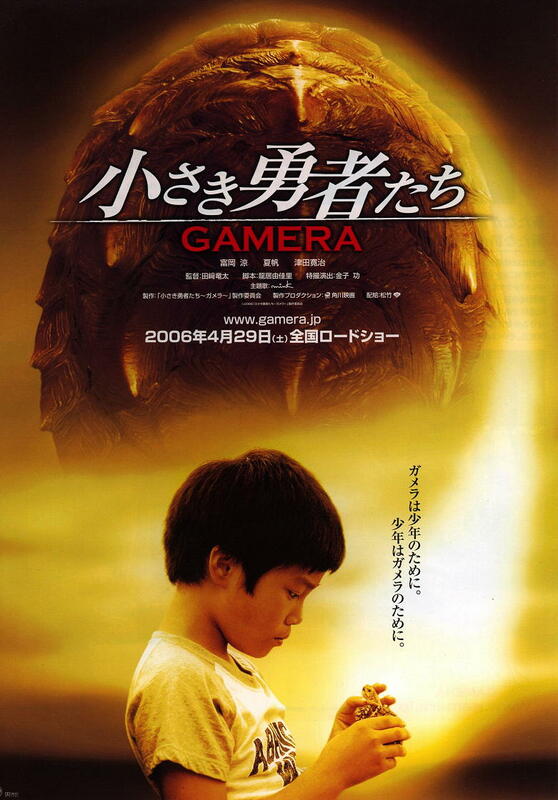 Little Braves of Gamera), is a kaiju film released in 2006, produced by Kadokawa Pictures. 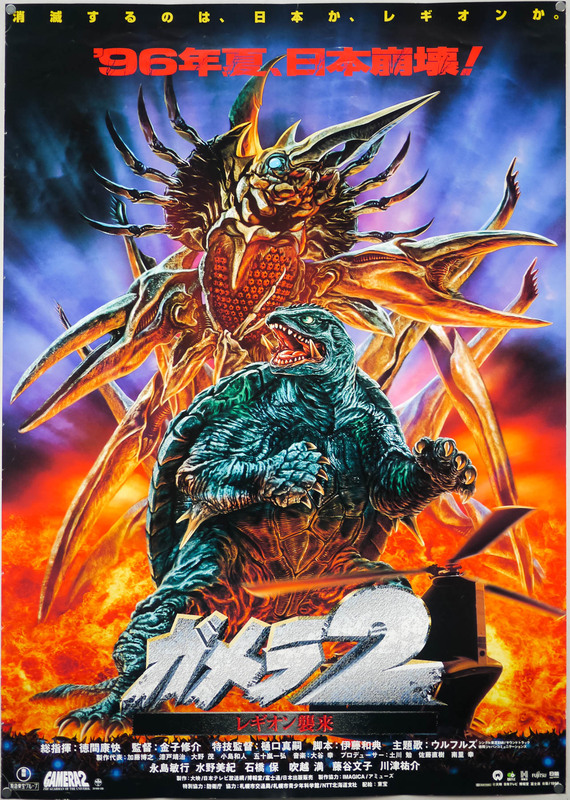 This is the twelfth entry in the Gamera film series, the second reboot of the series and the first produced by Kadokawa Pictures after they purchased a percentage of the remaining assets of Daiei Motion Picture Company, the original company responsible for the Gamera films. After Gamera self-destructs to destroy three Gyaos in 1973; the tale picks up thirty-three years later in 1993, when the son of one of the survivors of that incident finds an unusual egg, from which a baby turtle hatches. The boy, Toru, raises the turtle, quickly realizing it as being remarkable in that it hovers and breathes fire. The turtle quickly outgrows the house, is relocated by Toru and his friends to maintain secrecy and then disappears. Concurrently, many shipping disasters occur in the area, the cause of which is the kaiju Zedus (ジーダス), which soon thereafter rampages through the city. It corners Toru and his friends, but the boy's former pet, now significantly larger, intercedes. The young Gamera is wounded in the fight and captured by government officials, who hook the creature up to a machine which infuses it with liquid derived from mysterious red stones found in the vicinity of the egg and which scientists theorize give the Gameras their power. Zedus attacks again, and the new Gamera, now larger, goes out to battle him. 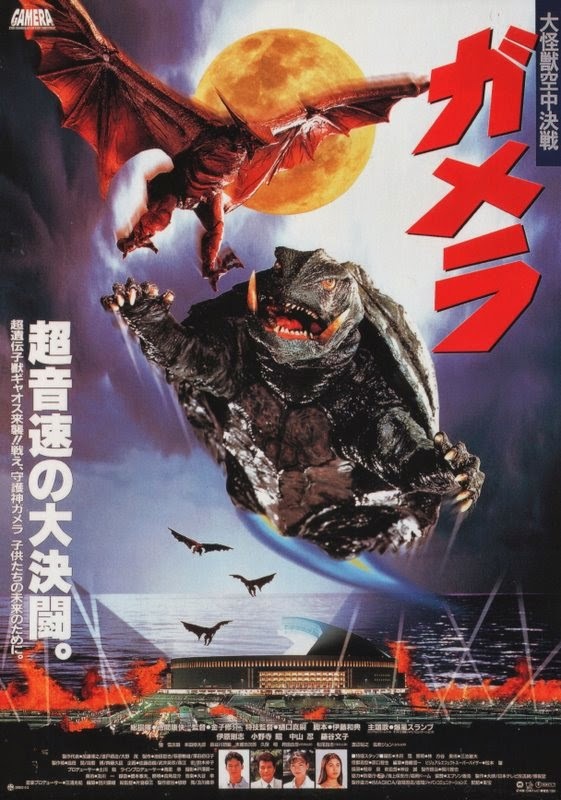 The human characters determine that the still-immature Gamera must consume the red stone which Toru had found with the egg in order to fully gain its powers.